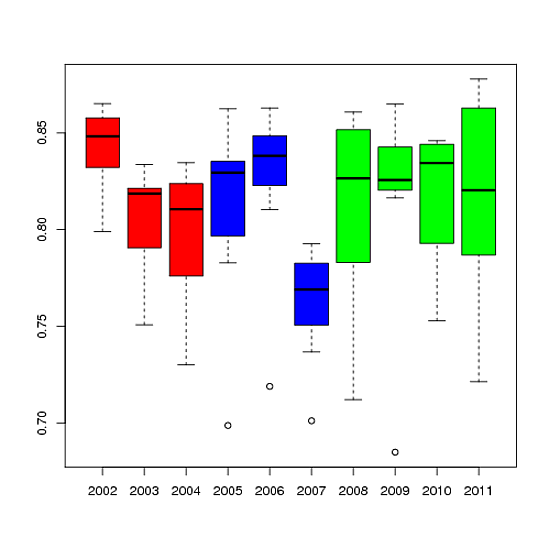 The Box-plot in the link, I want to display different background colour for example: 2002-2004 - in one group, 2005-2007 in another group while from 2008-2011 in another group. All groups could be displayed on different background colour with description of legend or notes at bottom on graphs. How can I display those group boxplots in different colours (each group boxplot should be in same colour)? How to specify ggplot2 boxplot fill colour for continuous data?